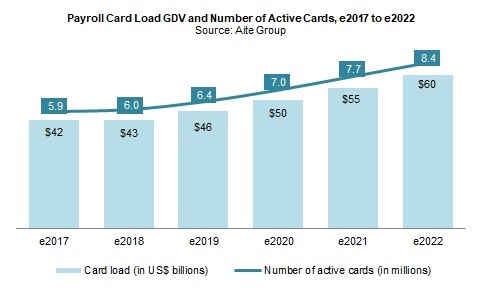 Payroll card gross dollar volume is forecast to grow at a CAGR of 7% through 2022. Boston, September 7, 2017 – While the U.S. prepaid payroll card market has seen strong growth over the last four years, it has not met expectations due to regulatory and compliance challenges, public relations issues, and the complexity of state wage and hour laws. Nevertheless, there is substantial opportunity in the U.S. market, especially in the midsize employer segment, and employers that would like to move away from a paper check environment still have plenty of opportunity for electronic wage disbursement. This report addresses ongoing regulatory concerns, introduces a five-year forecast, and provides insights from payroll managers. It is based on Aite Group interviews with industry executives representing more than 30 prepaid companies, an Aite Group telephone survey of 236 U.S. employers in Q2 2017, and qualitative interviews conducted by Aite Group during Q2 2017 with payroll executives from 20 organizations. This 27-page Impact Report contains 12 figures and seven tables. Clients of Aite Group’s Retail Banking & Payments service can download this report, the corresponding charts, and the Executive Impact Deck. This report mentions ADP, Amercian Payroll Association, the Consumer Financial Protection Bureau, FSV (U.S. Bank), Global Cash Card, Mastercard, Money Network (FDC), Netspend (TSYS), and UniRush (Green Dot).